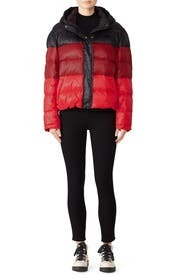 Warm up in cool color-blocked style with this Proenza Schouler White Label puffer jacket. Fits super cute, very warm and well designed. The colors keep it from being just another puffer. I may keep this one a minute. Fit perfectly except the sleeves are a little short. 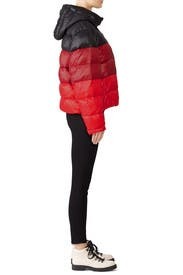 Shorter style, wide shoulders, very warm and high quality puffer material. I love this jacket! Warm and very stylish. 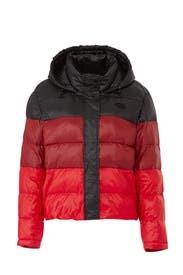 Love the colors in this color block puffer. It is slightly cropped and roomy but not too much so. The biggest negative for me was the sleeve length which was too short. I'm 5'8. This would be great on someone much shorter. Perfect length for my petite frame, arms fit as well which was great. A lot roomier / boxier than I had anticipated though, would be great for layering. Perfect, comfortable, warm, light, everything you want in a jacket! The jacket is very warm. 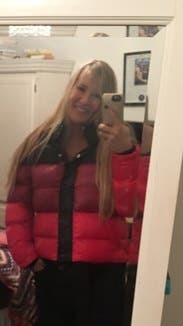 I got the jacket to wear it on my Iceland trip. The jacket was a little bit bigger than average xs jacket. But that allowed me to wear few layers inside. Got tons of compliments on the ombre colors and fit of the jacket. It was super warm and comfortable on a frigid winter day. Also didn't realize it has a great hood. I wore this many times while renting it! I loved the colors but thought it looked sort of standard. Warm, cute and comfortable jacket. This jacket is incredibly warm, and soft. I got tons of compliments when I wore it on a recent trip to CO! This looks great, boxy shape however so perfect on. light weight yet warm. 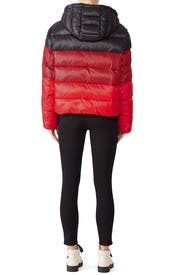 Never thought I would love a puffer jacket this much. Running true to size with some stretch, I recommend wearing your true size for your primary size and going up for your back up. This style is fitted throughout the midsection and fitted at the hips. It works for all cup sizes. At 5’6”, the length hit my hips on me. The colors on the coat are amazing in person and make it unique. I wore the L a couple of times. It's a cool jacket, very striking and more fashionable than the typical puffer. But I am very tall with long arms, and the arms were short enough to be uncomfortable, so I sent it back.